"Uncovering originalism and textualism in Singapore"
Introduction: Our judges in Singapore, like many of their counterparts in the West, tend to present adjudication merely as a mechanical exercise of applying the law to the facts of a specific case. In so doing, it would appear that the law can truly be separated from politics and judges merely follow pre-determined rules and exercise little discretion when making decisions. However, if we were to closely examine the prevailing theories of interpretation that our judges purport to rely upon when they resolve constitutional disputes, we may discover that these principles are often mere constitutional ‘fig leaves’ that cover their normative choices. 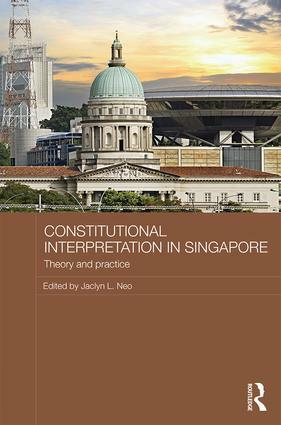 In particular, two such interpretive modalities are flourishing in Singapore: originalism and textualism. The point about the fig-leaf metaphor (and why it is so apt) is that fig leaves do not deceive anyone as to what lies beneath them. The fig leaf, like the swimming costume on a crowded beach, is to preserve the decencies. It enables individuals to interact in an appropriate manner without threatening the social order. Similarly, the use of fig leaves in Singapore demonstrates that our judges implic- itly accept the constitutional role that they are expected to play within our political system; and the truth is, our judges, on their own, can do very little. The political reality is that, in Singapore, the state has been governed by the same ruling party, the People’s Action Party (PAP), since the nation’s independence, and will be so governed for the foreseeable future. When legislative and executive powers are consolidated by a semi-permanent party, the dominant political entity in question can display its disagreement by overriding a constitutional decision easily with a constitutional amendment. Our judges, operating in such a political system, would not be oblivious to this fact. More significantly, Singapore has experienced a judicial crisis, which arguably has cast a pall over the state of constitutional review. When the Court of Appeal ruled against them in 1989, for the first and last time on constitutional grounds, the Government swiftly overturned this decision via a series of constitutional and statutory amendments within a month of the judgment. In that seminal decision of Chng Suan Tze v Minister of Home Affairs, the Court of Appeal, after surveying a litany of Commonwealth precedents, quashed the preventive detention orders issued under the Internal Security Act (ISA) against alleged Marxist conspirators and also concluded in obiter that the ministerial discretion to detain personnel under the ISA would be subject to an ‘objective’ test of review by the courts as constitutionally required under Articles 96 and 127 of the Singapore Constitution. This decision proved to be disquieting to the Government, so much so that in the subsequent amendments, it restricted judicial review in ISA cases to only narrow procedural grounds. Part II of this chapter begins by identifying and uncovering the judicial use of ‘originalism’ as an interpretive modality. Part III continues with a close exami- nation of the judicial reliance on ‘textualism’ as another preferred mode of con- stitutional interpretation. In essence, I shall seek to illustrate that the judicial decisions reached by our courts are neither mandated by the text nor the history of our Constitution, but are the consequence of normative choices made by our judges.